Melbourne City Council sent cleaners to Hosier Lane last week to tidy up garbage, graffiti and probably exterminate homeless people. This was in response to complaints from locals about the "squalid conditions" of the laneway, according to a brief in the New York Times. 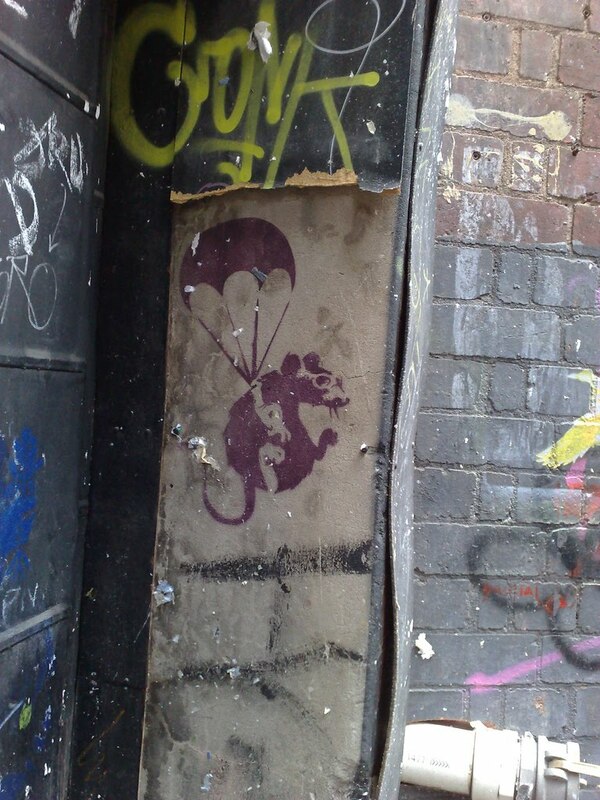 In the process they painted over a Banksy stencil that depicted a parachuting rat. It was one of a few Banksy's in the country and was practically untouched since 2003. The media were all over this story like vermin to cheese, with The Age reporting that Melbourne Council CE Kathy Alexander said council "should have acted sooner" to protect Banksy pieces like this. But it's redundant to say council should have acted sooner, when they sent their own staff to clean the mess that makes Melbourne the "street art capital" of Australia, according to Ms Alexander herself. The bungle outraged the Melbourne street art community. Following this, a stenciler headed out to Hosier Ln to 'stab back' at council. They sprayed 10 parachuting rats, where the original was destroyed, in fluoro. Banksy would be pleased with all the press. So much hype around his work ahead of the Australian release of his new film Exit Through The Gift Shop will only draw the attention of more people outside the street art community. The irony he uses to parody capitalist democracies is now so celebrated by the people within them that governments are consecrating his work - or reprimanded for not. Nuh. It's not a damn shame. Shouldn't be so precious about it. Stuff gets up. Stuff gets buffed. That clears the walls for more stuff to get up. That's the way of it. Well put Colin, I totally agree.